When choosing a printer it is therefore very important to consider the type of consumables it requires, the frequency of replacement, and the cost of each consumable. All laser printers require consumables from time to time. 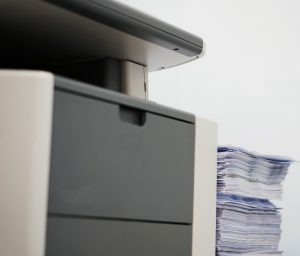 The replacement interval for a specific consumable depends on the brand of the laser printer, the type of consumable, and the usage of the printer. On personal and office printers the consumables can be very expensive in proportion to the purchase cost of the machine; users who perform a lot of printing may spend as much in a year on consumables as the original cost of the printer. When choosing a printer it is therefore very important to consider the type of consumables it requires, the frequency of replacement, and the cost of each consumable. The other major consideration when considering consumables is ease of use. Some printers require several different consumables, which may be difficult to install into the printer, while others provide all the consumables in one cartridge, which is easy and quick to replace. Printer consumables are becoming an increasingly important product in every office. Printer cartridges and toners can be very expensive and difficult to find, hence the need to maximize the potential of your printer, as it’s not only practical but cost-effective. Always go with popular name brands, as cheaper options will be shoddy and possibly damaging to your printer, but bigger name technology providers provide consistently more reliable, high-quality products. When it comes to documents of lesser importance, try using less ink or toner. To do this, simply find the printing preferences or printer settings tabs on your computer, and select ‘print in grayscale’ or ‘print all text as black’ to save on toner for everyday printing. The print cartridge used by some manufacturers is usually replaced before the photoreceptor and developer have finished their useful life. To exploit this, and reuse the mechanical elements in a print cartridge, some suppliers recycle print cartridges and refill them with toner. The degree of recycling varies considerably. There are many small companies who simply test the print cartridge and refill it with toner, others, including some manufacturers, strip and rebuild the print cartridge and provide a warranty for it. It would be worth the research to find companies who are willing to provide warranties on recycled print cartridges. This entry was posted on Friday, June 16th, 2017	at 11:59 am	and is filed under Printing tips	. You can follow any responses to this entry through the RSS 2.0	feed. Both comments and pings are currently closed.